Canyon Villas, desirealbe South Palm Springs location, stunningly maintained community. 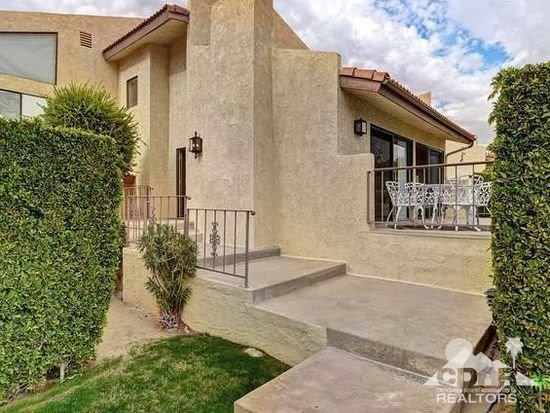 The end unit's entrence is amazingly private, located on the backside of the complex away from Palm Canyon traffic noise. This unit has literally three levels: below ground parking for two cars, laundry and storage closet, first floor of unit with livingroom, dinning area, large patio, bedroom and bath, third level has two bedrooms both with walk in closets and two baths..The home has a open floorplan with the kitchen, dinning area and living room looking out onto its private patio. Very spacious with nice light. NOTE: The heating and AC system is recently new....VERY Efficient! Newer H2O heater too! Fee land.